4.1.1 The Council’s estate has been under a period of review for the last couple of years with many decisions being made about which buildings are kept and where investment is to be made. These decisions are now made and a much more stable estate is emerging. Retained operational buildings have been classified according to 10 types and ranked against each other, using a benchmark in terms of energy consumption per floor area. 4.1.2 The planning in 2012/13 and the adoption of the Buildings and Energy Strategy has created the platform for creating priority action areas for 2012/13, and throughout the year the data will be subject to further scrutiny to identify additional opportunities for action. The Council’s Property Board is responsible for the delivery of the strategy, with the Buildings and Energy Group established to take day-to-day responsibility for the delivery of annual programmes of work, as set out in section 5.0. 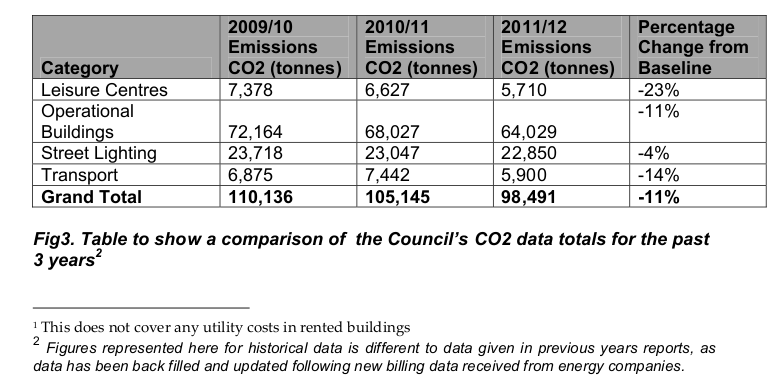 4.1.3 Through the actions delivered below, the Buildings & Energy programme contributed savings of 1,010 tonnes of CO2 in 2011/12, which equates to 15% of the Council’s overall carbon reduction last year. Additional savings achieved were from sources where their impact was much less straightforward to quantify, such as behavioural change, the implications of a mild winter, and a reduction in the number of staff employed by the authority, an analysis of which is contained in section 5.6. 4.2.1 The Council saved 213 tonnes of CO2 in energy consumption costs through reducing the number of buildings in its operational portfolio in 2011/12. As many closures occurred towards the end of the financial year, full-year annual savings going forward for these rationalised buildings will be significantly higher, equating to 1,089 tonnes of CO2. 4.3.1 The Town Hall Complex Transformation Programme has been continuing throughout 2011/12, with substantial improvements being made to the Town Hall Extension and Central Library. The programme is due to be completed in 2013/14 and will be a major contributor towards the Council’s 2020 carbon reduction target of 41%. The project to develop a new detailed carbon calculation methodology for capital projects were put on hold until 2012/13 due to resources for delivery being unavailable. 4.3.2 The City Centre Heat Network Work has continued to develop over the last year towards delivering a City Centre Heat Network to serve the Town Hall Complex and surrounding buildings. Further work is planned for 2012/13 with the first stage of delivery expected to be in early 2013. There is the potential for heat networks to provide secure, low carbon and affordable energy to residents and businesses across the city. The Town Hall Heat Network will be the first of several ‘clusters’ which will be delivered in the coming years, expanding and joining up to deliver with other clusters over time to create a new critical infrastructure to support the city’s future low carbon growth and regeneration. 4.3.3 Voltage optimizer installation. The pilot installation of a single voltage optimizer in Heron House is on target to deliver a 10% reduction in electricity consumption, saving 60 tonnes of CO2 over 8 months in 2011/12. 4.3.4 Energy audits for building retrofit. In-depth energy audits were completed on two large Council office buildings – Alexandra House and Heron House. The audits identified a portfolio of measures and works that could significantly reduce energy consumption depending upon level of investment made and integration with other planned works. 4.4.1 Asset Management Plan. Through Corporate Property’s scheduled maintenance and improvement works conducted over the year, such as boiler repairs at Wythenshawe Hall, 211 tonnes of CO2 was saved across the estate. 4.4.2 Heating controls. By switching down heating controls remotely through Building Management Systems and 22 on-site by engineers, and through implementing a revised winter heating strategy, savings of 526 tonnes of CO2 were achieved. 4.4.3 Smart Meters (Automatic Meter Readings). 62 smart meters were installed by the Energy Management Unit last year allowing building managers to better monitor and manage their electricity consumption, identifying the reasons as to why any increases in consumption occurred and making the necessary interventions. 4.4.4 Low-carbon energy generation. Project development work continued in 2011/12 on a potential heat network that would incorporate the Town Hall complex. Feasibility work for Solar PV installations could not be taken forward into delivery due to the government’s review of the Feed-In Tariff rate in 2011/12 and resulting impact on business cases and delivery deadlines. 4.5.1 LED lighting. An LED installation programme at Manchester Art Gallery was introduced at the end of last year, with 2 of the 20 galleries having them installed in March 2012. The resulting carbon and energy bill savings will therefore be seen in 2012/13 onwards. 4.5.2 Technology for behavioural change. MDDA’s (Manchester Digital Development Agency) ‘Save Energy’ project in conjunction in Manchester Art Gallery concluded this year providing pilot studies about how technologies can influence behavioural change to reduce energy consumption, across a number of operational areas. These included use of the lifts, catering (including use of energy display screens), lighting and atrium doors. Results varied for each area of consumption with overall savings for the pilots of less than 10%. Lighting contributed the most savings (47% electricity reduction in lighting test area) and this has been reflected in the current LED roll-out in the Gallery. Many other lessons learnt have been identified and fed into the in-depth energy audit currently being carried out. 4.5.3 Manchester Sport & Leisure Trust (MS&LT). MS&LT (an independent Charitable Trust that manages leisure facilities throughout Manchester) introduced a sustainability policy for staff and developed a low-carbon plan that will lead to delivery of spend-to-save energy efficiency projects in 2012/13. 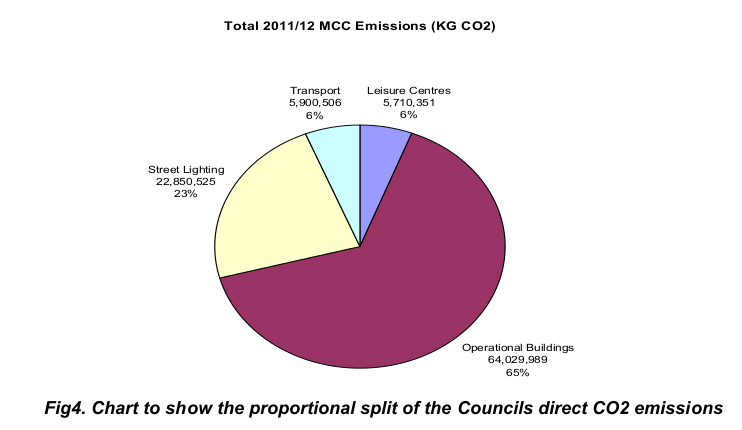 4.6.1 The Council has undertaken a range of measures which have reduced emissions from transport. This includes highways improvements, staff travel, commuting, and fleet interventions. This built on the significant progress made in previous years, although there is much left to do and transport remains a key area for reducing the Council’s emissions. Most of the actions outlined below impact on the Council’s own emissions, however, others which do not have been included due to the significant impact they will have on the City’s emissions. street lighting and other street facilities including signs and bollards.  The Council is working to significantly reduce the energy consumption of its street lighting and is currently exploring replacing street lights across the city with LED fittings, and/or slightly reducing the brightness of the lighting without impacting on the highway user.  These measures would greatly reduce the cost of street lighting energy which is approximately £3m p.a.  In addition, the Street Lighting PFI Service Provider (Amey) has commenced a programme of replacing existing illuminated bollards and signs with LED apparatus. Outside MCC, all traffic signal heads are being replaced with LED bulbs. with staff commuter cycling increasing from 6% to 10%. efficient cycle purchase by staff, and for a car club service provider. the way the service is run. TfGM have successfully bid for £32.5m of DoT resources from the Local Sustainable Transport Fund for projects across GM. This is in addition to the £5m Key Component bid for commuter cycling secured earlier. 4.7.1 Although they do not directly impact on the Council’s direct CO2 emissions, the three key areas of sustainable consumption and production: food, procurement and waste management, are all important enough to be a substantial part of the Council’s work due to the fact that they all impact significantly on our indirect emissions.  The Council has evaluated over 1000 suppliers on their environmental sustainability impacts as part of the sustainable procurement process. A sustainable procurement training programme for staff has taken place, which is supported with new intranet guidance for staff in 2011.  Four supply chain projects were run, one of which (The Northwest dCarbon project) engaged over 133 MCC suppliers and found 43% were managing emissions.  The Council reviewed the sustainability questions included at PQQ (Pre-Qualification Questionnaire) and tender level, to ensure suppliers are aware of the policy and carbon reduction targets in Manchester: A Certain Future (MACF). Manchester Fayre carried out a carbon audit of the school meals service, and Fishy Fridays were added alongside the Meat Free Monday menus in schools where Manchester Fayre provide the catering.  The City’s Sustainable Food Delivery Plan was completed in November 2011. Reserve to deliver projects; Growing Manchester’s community food growing projects, the Fareshare New Smithfield Market project, and a Baseline Study of Sustainable Consumption and Production.  The Food Futures programme ran both a Food Futures Expert Panel and Food Futures Forums, and The Truly Good Food award scheme had a total of 40 award holders.  In year 2011-12, the Council achieved a 34% recycling rate for domestic waste – an increase of around 9% on last year. This equates to 58,500 tonnes diverted from landfill.  Overall the city produced 7% less waste than the previous year.  The food waste trial with Enterprise increased from 12 to 152 schools in 2012.  The proposed roll out of waste collections to all high rise properties was not completed in 2011, due to the challenging nature of both collections and storage of bins. inform development of the plan for 2012/13.  8,500 trees were planted on known schemes across the City, including 5 community orchards. This is over double the target of 4,000 trees per year, as set out in the Manchester Tree and Woodland Strategy.  Development work has been undertaken on a new Manchester Green and Blue infrastructure Strategy and is ongoing in line with the review of Manchester – A Certain Future, which will be delivered in 2012/13.  Manchester designated its latest and largest LNR (Local Nature Reserve) at Wythenshawe in December 2011. In 1997 we had one LNR covering 19 Hectares, we now have 8 LNRs covering 390 Hectares. Over the next two years we should achieve the Natural England target of having 1 hectare of LNR per 1,000 head of population (currently approximately 475,000).  A range of partnership projects have also been delivered this year, including a £2 million project to improve water quality in the Moston Brook led by United Utilities and a £500,000 brownfield regeneration project at Nutsford Vale with Groundwork and Red Rose Forest. 4.9.1 This section outlines ways in which the Council is working with its staff and changing its processes to meet its core aim of becoming a low-carbon Council by 2020. 4.9.2 Over the past year there has been two ways the Council has attempted to affect culture change in staff, the first is by initiating a Carbon Literacy pilot, and secondly by running a team-based scheme, (Green Impact), which encourages low- carbon behaviours. 4.9.3 The Council has also been working to embed climate change awareness into its major systems and processes in order to reduce its emissions. By introducing elements of carbon management into existing systems, the monitoring and reduction of carbon can be mainstreamed thus delivering wholesale culture change.  The Manchester Carbon Literacy Programme began in 2011, and Cooler Projects won the contract to deliver the citywide development programme.  The Council has completed a pilot scheme – training 10 MAES (Manchester Adult Education Service) staff and tutors who work with complex families and in schools to be carbon literate.  In 2011/12, the Council was the first local authority to pilot Green Impact, a programme run by the National Union of Students.  The programme has been a success in engaging a number of staff in positive environmental behaviour change. Twenty-five teams signed up to the online workbook with many gaining a Bronze, Silver or Gold Award, and in total 295 staff contributed to completing the workbook.  A Service Plan review and refresh was undertaken in August 2011 and now all service plans correlate to the new Council structure with individual service plans beneath that where required.  In all there are four high level plans, with several service specific plans underpinning each of them.  A low-carbon Appendix was appended to each Service’s Business Plan, outlining the year’s actions each service would aim to take throughout the year. All actions originated from each services 10-year low-carbon Delivery Plans.  The Directorate for Adults has a low-carbon Board which helps it implement the actions within its services. Other Directorates are now looking to adopt this model.  Gateway applications are now assessed for projects’ contribution to carbon at three critical stages out of the five-stage capital planning process.  The finance department have supported the assessment and payment of the Council’s Carbon Reduction Commitment liabilities in 2011.  Carbon budgets have been rolled out, and the process for creating and monitoring them was agreed by key stakeholders at the SMT Use of Resources sub-group.  Roll out thin client (WYSE) terminals to replace PCs and Laptops wherever possible. Thin clients have now been provided wherever it has been deemed feasible.  Investigate the potential to invest in technology that will ensure all ICT equipment is switched off when it’s not needed.  The introduction of Flexible and Agile working throughout the organisation has assisted in this, since adopting an 8:10 desk ratio, in many cases also means adopting an 8:10 ICT hardware requirement. shows a 6% real reduction in usage. however, there are certain areas where quantification is possible, such as the buildings and energy programme. The attributable financial savings for which are listed in the table below. 4.11.3 The Council manages its carbon performance by tracking its emissions quarterly and annually. Quarterly reports are submitted to the Strategic Management Team, and into Directorate Management Teams, who can use them to track performance. Detailed records of carbon performance are available from 2009. There has been a positive downward trend of emissions produced by the Council over the past three financial years. The table below shows that the Council has made savings of 5% and 6% in the two previous financial years respectively. 4.11.8 As shown above, 71% of energy use is directly related to buildings through the Council’s Operational Estate (65%) and Leisure Centres (6%). This area presents one of the biggest opportunities to reduce emissions. 4.11.9 Within Manchester City Council’s portfolio, there are some outsourced services that the Council takes responsibility for when reporting its carbon emissions. Primarily these are Leisure Centres managed by the Manchester Sports and Leisure Trust (whose energy management services are provided by Serco Leisure), and domestic waste collection services provided by Manchester Enterprise, a joint venture between Manchester City Council and Enterprise PLC (included within Transport figures). Additionally Street lighting is run in a Private Finance Initiative with Amey.